I'm a sucker for bands that fall under the broad umbrella of "atmospheric black metal." I'll listen to it all day long with a smile on my face. It's my Kryptonite. 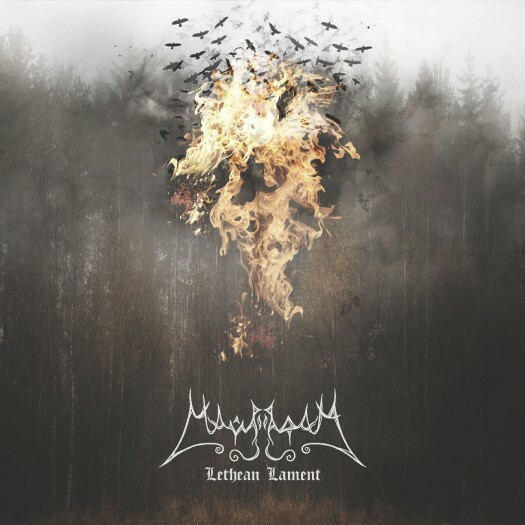 So it's even more exciting when something truly remarkable raises itself above the rest of the field, and Mavradoxa's second album, Lethean Lament, does just that. The album opener, "Cicadan," is a perfectly pleasant acoustic intro, complete with violin, but it only hints at the direction of the rest of the album. "The Phantom Visages" roars in with a dirty, Sabbath-y guitar tone with a doomy/folky vibe that runs through the whole album. The vocals have just a touch of extra grit to them, sounding almost as if the singer were on the edge of emotional/physical exhaustion, but pushing through nonetheless. To my ears, the musical influences run more to a classic doomy sound with lots of Iommi-an riffs rather than any second-wave worship, and in that respect, the band shares similar territory with Falls of Rauros. I know I name-check that band a lot, but I think that's only because Falls of Rauros is both very good and also helps broadly define a subgenre of nature-inspired black metal with classic rock and metal influences, and Mavradoxa fits very nicely in with that company. Both bands make me feel that same sense of melancholy, triumph, and awe all wrapped together. The shining jewel of this album has to be the nearly 18-minute "Crimson Waves of Autumn." A brief, shimmering acoustic intro starts things off. The melodic lines plus the clean vocals, both solo and harmonized, give the first third of this track a very nice, Alcest-y feel. It's lovely, and the contrast with periods of heavier, chunkier riffing makes it all the more effective. Just after the 6:30-minute mark, harsher vocals enter, and the accompanying melodic line is just perfection. It makes me feel things that I'm not even sure how to articulate. As I said, it's a sense of melancholy and triumph all at once. And this isn't even halfway through this monument of a track. If I had one minor complaint with the album is a whole, it would be the length. It's an hour and 6 minutes, and although that's no record-setter by any means, the album stacks four songs in the 11 to 18 minute range in between the relatively short intro and outro tracks, and the fifth track, "From Fog," suffers a bit in comparison to the beauty of "Crimson Waves of Autumn" and "Across the Nival Grove." "From Fog" isn't a bad song at all, but after being emotionally wrung out by the earlier tracks, it does make the end of the album drag a little bit. That said, I feel bad even spending that many words on a misjudgment in sequencing/length, because this is truly a remarkable piece of "Laurentian black metal," as the band calls themselves as a nod to their Canadian origins. I suspect I'll very likely put this band in heavy rotation alongside my favorites from Falls of Rauros and Alcest, and that's pretty high praise from me. Just downloaded this. I was hooked with the preview track (Crimsom Waves...) so am looking forward to kicking back and listening to the rest of the album.